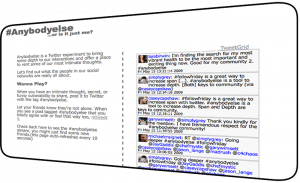 I am sure you have noticed a trend in Twitter towards gathering massive numbers of followers. Increase you influence right? The hashtag #followriday, created by @micah (Micah Baldwin) is all about connecting Twitterers to others worth following. Span is great for increasing your information flow and you sheer reach in Twitter. @micah’s 6000 followers are a mere village compared with @britneyspears 1.5 million. My paltry 350 isn’t even on the map. But there are VERY different conversations going on in these three Twitter accounts. Britney is using Twitter as a free ad campaign, posting trivial self-promotional tweets and links designed to amp her image and sell her wares. Micah is an influencer, using Twitter to shape conversation, establish credibility and interact with current and future audience for his ideas. My Twitter is almost totally personal. I keep up with buddies and plan coffee shop encounters, throwing in the occasional 140 character philosophies. 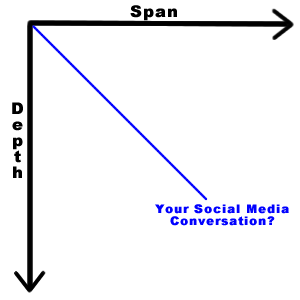 Along another axis in the social graph to span in Twitter is what I will call ‘depth.’ Depth has nothing to do with the importance of what is being said or the profundity, but the level of intimacy among connections. @micah drops some serious science in Twitter but how truly connected is he to his 6000 followers. Never mind @britneyspears. #followfriday is a great way to increase span. But what if we want to increase depth? What does it take to increase depth in any relationship? One way is to cultivate increasingly intimate shared experiences. Think about the closest people in your life (your real life, not Twitter;) Most people would say about these relationships: “we’ve been through a lot” or “They know me better than I know myself.” These relationships are a natural product of common interest + time, creating a shared reality and intimate mutual understanding. What if we could quicken this process? I find I can deepen connection in the real world by being more open, risking vulnerability and coming to the shared realization with others, that we have a lot in common at the deeper levels. This is not always easy, but it has proven a rewarding practice. I try to take a lead in this vulnerability process with my friends as well as with new acquaintances. Sometimes it doesn’t work really well, but I have never been harmed in the process and find it’s usually well worth it. So how would we practice this online? I am glad you asked. Inspired by a group ice-breaking exercise I experienced at the Authentic Man Program, I envisioned the Twitter experiment #anybodyelse? When you have an intimate thought, secret, or funny vulnerability to share, post it to Twitter with the tag #anybodyelse. Let your friends know they’re not alone. When you see a post tagged #anybodyelse that you totally agree with or feel that way too, retweet it. 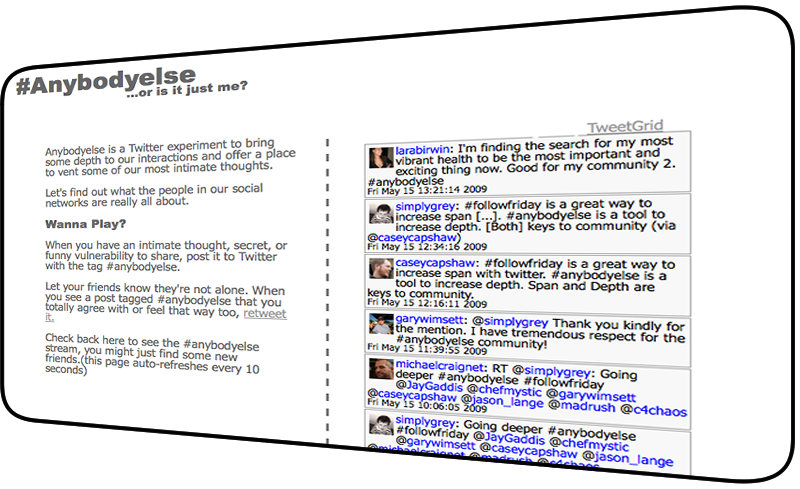 #anybodyelse is a practice to bring more depth into our Twitter connections. It is a way to encourage vulnerability, inviting more intimate connections. It may not be for every Twitterer, but if your aim is to connect, then I encourage you to balance your practice of increasing span, with a practice of increasing depth. In my experience, this make for more rewarding social media. BritB is at it again in her newest song Hold It Against Me. Max Martin’s and Dr. Luke’s low beat is great with Britney’s electric voice! This single just makes me want to move.